The Sino-Can Dual Diploma Program (also known as the Manitoba Program) is authorized by the Guangdong Education Department. It is signed and supported by Clifford School and the Manitoba Education and Advanced Learning Department (Canada). The Sino-Can Dual Diploma Program enables students to receive both Canadian and Chinese diplomas once they graduate. The Manitoba (Canada) program is recognized by international universities. This includes Canada, the United States, and many other Western universities. The Manitoba (Canada) program offers a reliable and well regarded path for students who desire to study abroad. The Sino-Can Dual Diploma Program is a combination of Chinese and Canadian education systems. This program offers both Canadian (Manitoba) and Chinese courses and uses current Canadian resources. The Chinese textbooks are issued by the Chinese National Ministry of Education. By combining Chinese courses and Canadian (Manitoba) courses, our curriculum offers both western interactive teaching styles and disciplinary Chinese teaching methods. This combination fosters students’ ability of independent and critical thinking. After meeting course requirements and after passing their provincial exams, students receive both Chinese and Canadian (Manitoba) diplomas. With the Canadian (Manitoba) diploma, graduates can apply directly to international universities. Students of excellence are eligible to receive scholarships to numerous Canadian and international universities. 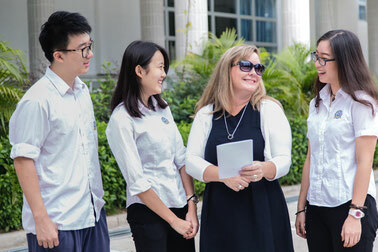 Students that are taking the Sino-Can Dual Diploma Program have the opportunity to study numerous optional courses that vary from year to year and are generally offered based on student demand. These optional courses include a number of courses at the AP (Advanced Placement) level, such as: Calculus AB, Chinese Language and Culture, Environmental Science, Human Geography, Micro Economics, Macro Economics, Psychology, Computer Science, United States History, and Statistics.